In MFWD Tractor Row Crop application, what tire features should grower look for to improve traction, reduce operator fatigue, and improve yield? One of the most effective ways to improve traction, protect yields and reduce operator fatigue is to operate at the lowest appropriate inflation pressure. Reduced pressure creates a larger footprint, which increases traction in all conditions. That larger footprint also increases flotation. By increasing flotation, you can reduce rolling resistance and minimize soil compaction. Reduced compaction has been shown to improve yields by preserving the soil’s natural structure, which contains spaces where air and water can be accessed by growing roots. The reduced pressure in the tire also allows the sidewall to act as shock absorbers between the operator and the field, reducing jolt and vibration and providing a smoother ride that reduces operator fatigue. Reducing inflation pressure can be accomplished with any tire—just check the manufacturer’s load/inflation table for your tire at the weight and speed you’ll be working with. New technologies such as IF (increased flexion) and VF (very high flexion) tires really amplify the effect because their design and construction allow them to operate at especially low inflation pressures, and their extra-flexible sidewalls provide an extremely smooth ride. For decades the vast majority of the tires leaving the factory on MFWD were typically stand row crop duals, meaning typical width of the tires are about 18”. The concept is that the tires will run in the row and straddle the planted seed bed. Technologies in those sizes have evolved to IF/VF. This is a deflection technology in which tire manufacturers are allowing end users to operate at lower inflation pressures 20% with IF and 40% with VF. As the tire deflects more the footprint grows and increases the contact area of the tire reducing the ground bearing pressure and in turn reducing compaction. The major downside is that this technology is 100% based on the fact that end users have to constantly maintain and adjust inflation pressures according to the application or implements they are transporting and using in the field. The one time inflation pressures are not adjusted, that end user just lost the advantage he paid for getting into IF/VF technology tires. Titan/Goodyear along with most major tire manufacturers have IF/VF technology, but we prefer to live in the real world knowing that end users have an extremely difficult time managing inflation pressures if they do at all. I always give the example of the guy that has a folded up planter hitched to the back of his MFWD tractor with dual IF tires. In order to transport that planter the tires will have to be inflated to 18 psi to carry the additional load. He drives 15 miles to the field, then unfolds the planter, he now needs to get out and spend the next 15 to 20 minutes letting air out of his tires to the proper inflation of 8 psi to utilize the IF technology. Once he is finished planting, he then folds up the planter getting ready to move to the next location. But before he can, he must get out and spend another 15-20 minutes putting air back into the tires to 18 psi to transport. I think you can see the inefficiency of this and how the majority of growers will not do it. They will most likely set it at 18 and just leave it for the rest of the season, by doing that they have lost all advantage they paid extra for. I believe in most every case if not all this happens, and at the end of the day it is not a value to the grower. Titan has introduced what I call a dummy proof bolt on technology with our LSW Extreme Floatation super single line. These LSW (Low Sidewall) tires not only incorporate LSW technology which reduces power hop and road lope that improves operator comfort and fuel economy, these tires due to their physical size are designed to replace standard row crop duals providing up to a 25% larger footprint under the tractor. Not only do these tires float better in the field, they don’t rut like standard row crop duals in wet conditions, minimizing residue disturbance. Pinch row compaction is definitely on the minds of producers and this option addresses that concern not only on MFWD but articulated tractors that may be put into a planting application. Some trials have shown as much as 5 bushels more per acre benefit using the LSW super singles instead of row crop duals. The planted seed bed is more uniform and stable without ruts reducing the amount of water standing in wheel tracks all season long negatively affecting the yield and bottom line. Manure haulers have found these to be the tire of choice due to the minimal field disturbance and rutting in less than favorable conditions along with ride comfort when transporting. When selecting a tire for MFWD Row Crop tractors, there are several factors that should be considered to improve traction, improve yield, and reduce operator fatigue. Tires with the correct load carrying capacity for the tractor and implements should be used. Correct air pressures help eliminate tire issues from overloading and rider comfort. The lower the air pressure a farmer can use, the softer the ride. Proper traction is important to minimize fuel costs, save operator time in the field and avoid slippage on the tires. BKT’s radial agricultural tires are designed as R-1W’s with a 45 degree lug. The R-1W has 20% deeper tread than a comparable R-1. The 45 degree lug provides excellent traction in the field. These tires have excellent self-cleaning features that prevent mud and dirt buildup in the lugs. Air pressure is important to gain proper traction and reduce soil compaction. By using the correct air pressure for the load, the user gains a wider footprint for traction. The wider footprint also distributes the weight of the tractor to a wider area, and reduces soil compaction. Reduced soil compaction leads to better yields. In selected sizes, soil compaction can also be minimized by using “IF” rated tires. The “IF” rated tire is designed to carry 20% more load at the same air pressure as a standard tire. With this in mind, you can run these tires at lower air pressures to carry the same weight as your standard tire. By using less air pressure, the user lessens ground bearing pressure, reduces soil compaction, and gains better yields. Eliminating power hop is important for driver comfort on a MFWD tractor. This can be achieved by insuring that the tractor is weighted correctly with the proper air pressure. It guarantees a smoother ride. When mounting new tires, the beads should be properly seated to the rim to eliminate vibration and sway. BKT utilizes a 45 degree angle lug for road transfers. This gives the tire a smoother ride, and added stability while moving from field to field. If tire sizes are changed on a MFWD, the user must stay in the lead/lag guidelines set by the manufacturer. If rolling circumferences are mismatched, this can cause tire wear problems and possible transmission problems. This also effects ride comfort. By selecting the right tire for the load, using the correct air pressure for the load, and setting up the MFWD tractor by manufacturer standards, this will insure that you will reduce soil compaction for better yields, have improved traction, and enjoy a better ride. In a MFWD Row Crop application, there are many things that can be done to improve traction, reduce operator fatigue and, especially, improve yield. For instance, you need a tire that can carry the maximum operating weight at low air pressures in addition to providing a long, wide, flat footprint as a result of flexible sidewalls. One of the simplest, most cost effective, is to fit your tractor with VF tires. With the help of your Michelin Ag Rep, you will have the ability to weigh your machine, calculate the proper weight distribution to transfer maximum torque, and dial in your air pressures to the lowest possible inflation to carry the maximum load. With proper weight distribution and air pressures in a VF tire, you will gain an incredible foot print that, not only, carries your load smoothly across road and field, but will provide you with substantial traction and yield gains due to less compaction! 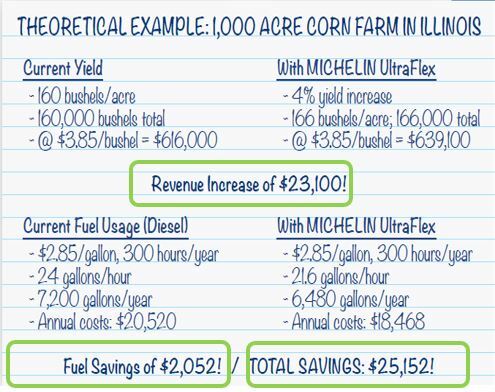 Recently, Harper Adams University has conducted an independent study showing yield gains of up to +4% and fuel consumption of -10% while using Michelin VF tires vs standard tires. The revenue increase deserves a look! First, we must recognize that today’s tires have evolved in parallel to agricultural machinery technology and can supply optimum performance. Tires are no longer a “commodity” or a “black doughnut” and are the key piece that allow all the machinery’s power to be transmitted to the ground. Every farmer strives to use 100% of horsepower available to them. There are several aspects a farmer must consider when selecting tires for his equipment. The selection will depend on the objective, for example, traction, compaction, ride comfort, etc., and also take into consideration restrictions such as max size that can be used, local weight and width restrictions, farm space, etc. Once the size has been selected, the producer must decide which technology and design to choose. First, take into consideration the tread pattern type. For tractors, most commonly used are the R-1 or R-1W types. R-1W is an evolution of R-1, where the W means “Wet”. A notable difference is that on the same tire size, the height of a lug on a R-1W is 20% taller compared to an R-1. Also, the profile of an R-1W is squarer in shaped than a R-1 tread design. Advantages of an R-1W design are better traction due to lugs going deeper in the soil, more lug contact with the ground which allows better traction and less compaction, and also longer durability as the tire has 20% more rubber on its shoulder. The second point is the lug pattern design. Tires have evolved from the traditional 23-degree lug design to the advance design to up to 45 degrees. With a 45-degree design, the tire offers more lug area in contact with the ground all times. In addition, the 45-degree lugs improve ride comfort. Having a 45- degree design allows the tire to have more lugs on the ground at the same time with a smoother and seamless transition between lug contact. A 45-degree lug design is considered a midpoint between a bumpy ride in a metal track design which would be lugs at a 90-degree angle with the ground, and a rib tire where the ribs are parallel with the direction of travel. The next point is the lug design and geometry. Traditionally, lugs were a designed to be straight with a 23-degree angle with a constant width. After years of testing and experience, current lug designs have adapted to be curved to ensure better traction and self-cleaning capabilities. Among the most advance tire designs – like Trelleborg’s TM series – include lugs with various widths, “wings” on the end of the lug that help to maximize the tread width for an extra wide footprint resulting in lower compaction, and a wider lug head to improve wear resistance and longevity. These lug designs and R-1W tread pattern work together with the extra flexible sidewalls. Don’t be afraid to lower the air pressure, following the manufacturer’s recommendation, depending on the load and speed, and allow the tire to “bulge” on the side. Tire manufacturers like Mitas and Trelleborg – design their tires in order to be flexible, improving the footprint area to protect from compaction, and improve ride comfort. In addition, other innovative designs help improve traction and self-cleaning capabilities. Trelleborg’s Progressive TractionTM design relies on an innovative double edge lug. The technology introduces two points of anchorage to boost grip for improved traction. The stronger lug base also reduces vibration, wear, and fuel consumption. Trelleborg tires are well known for their inter lug terraces. This design, combined with the flexible sidewalls, allows the tire to expel the soil that can stick between the lugs while in the field. This feature improves traction and ensures cleaner roading. All these innovations allow the farmer to increase his equipment efficiency, reduce compaction, boost yields, reduce fuel consumption, reduce wear, reduce driver fatigue and most importantly, improve his bottom financial line. We have to remember that all these advantages can only be exploited if the tire is used correctly like it has been designed. Trelleborg works hand in hand with major equipment manufacturers to ensure tires are designed and matched to equipment needs. From the farmer’s side, he must be conscious that the correct inflation pressure enhances all these benefits. Check the tire manufacturer’s manual and find out what the correct inflation pressure is for your equipment and application to maximize results. When faced with these questions all at one time, operators may feel like a deer in the headlights. To avoid that feeling and to prevent you from saying, “just give me something that works”, here are a few explanations to the questions so you can be confident making a tire purchase. When purchasing tires for a MFWD tractor used for primary tillage or planting, radial tires are more efficient then the same sized bias tire. When properly inflated, radial tires develop a longer footprint compared to the bias tire and carry the same axle load at less inflation pressure. The longer footprint allows for more tread bars to make contact with the soil and it develops more traction. More traction results in less slip and that allows for more work to be completed in the short planting and harvesting window. Research conducted by tire companies, equipment manufactures and land grant universities, radial tires developed 6% to 14% more traction verse the same sized bias tire. This increase in traction resulted in more work being done per hour, less fuel being used per day, and less hours put on a tractor each year. The longer footprint of the radial tire also results in a longer wear life compared to the bias tire. This longer life is directly related to the fact there are more tread bars making contact with the ground which reduces contact pressures. Reduced contact pressure means the tread bar will not wear out as fast. The improved wear life is one of the major reason radial tires are used on cars, light trucks, and large trucks. Radial tires are also designed to carry the same load as bias tires with less inflation pressure. The ability to use less inflation pressure results in less soil compaction improving crop health. When properly inflated, radial tires have the signature sidewall bulge or look flat compared to the bias tire. This bulge, or sidewall deflection, is what allows the tread to have the longer footprint. The deflection also allows for a softer ride which could help reduce operator fatigue after a long day driving on rough ground. Yes, radial tires do cost more because of the materials used and how they are constructed. This cost difference is offset by the increased in traction, reduction in fuel cost, longer tire life, less soil compaction and a more comfortable ride. The agricultural tire industry classifies the tread depth of traction tires using the nomenclature R-1, R-1W, and R-2. This marking helps tire manufactures standardize the tread depth of a tire, so operators can properly compare tires. The R-1 tread depth is the base tread depth for that size. Tires marked R-1W have a tread depth that is 20 to 30% deeper than the same sized R-1 tire. The tread depth of R-2 tires is two times deeper than R-1 tires. In most North American soils, R-1 and R-1W tires are the standard tread depth used. In normal soil conditions there is little to no traction difference between a R-1 and a R-1W tire with the same tread pattern. The R-1 tire provides excellent traction and wear at a lower cost compared to a R-1W tire. R-1W tires do have a longer wear life because of the deeper tread depth and in wet conditions can provide a little more traction compared to the R-1 tire. R-1 and R-1W tread depths tires are the most common tires in the market. When working in wet soils found in the Mississippi Delta, in any bayou region, or muck soils a R-2 tread depth tire is recommended. The extra deep tread is designed to penetrate the mud and provide traction. While these tires provide excellent mud traction, the extra deep tread depth and the very open tread pattern typically causes a lot of vibrations into the cab of the tractor when transporting the tractor on the road. R-2 tires are only recommended in the regions where operators are always in muddy soil condition. In the past decade, the tire industry has been developing and releasing the newest radial tires marked IF and VF. Radial tires marked IF carry 20% more load compared to standard radial and VF tires carry 40% more load. The IF tires and VF tires when inflated properly to carry the axle load do provide a longer footprint compared to the standard radial tire which does improve traction. The improvement is not as great as the transition from bias to radial tires, but there is up to a 5% increase in traction using IF tires. On MFWD tractors, operators who see the greatest benefit are the ones who are carrying heavy axle loads and using inflation pressures above 25 psi. Typical conditions where the IF or VF tires make sense are on tractors that are carrying heavy 3pt tillage tools like a 12 or 16 row bedder or a 2pt mounted 24 row or larger front fold planter. With these heavy rear axle weights dual 480/80R50 tires will need 35 psi to carry the load and in some cases, the weight exceeds the capacity of the standard radial tire. In this applications dual IF or VF 480/80R50 tires can be used to carry those load and may only require 23 psi. IF or VF tires are recommended on the front axle of a MFWD tractor that is equipped with a front axle suspension, uses a full rack of suitcase weights, and cannot use duals. The front axle weight of MFWD tractors set up in this configuration overload standard radial tires by 2,000 to 3,000 lbs. The same sized IF or VF tires have the extra load capacity to carry these heavier loads. There are operations that do not benefit from the IF or VF technologies. When the MFWD tractor is properly ballasted and the correct inflation pressure on standard radial tires is 15 psi or lower, the upgrade cost to IF or VF is hard to justify. On a 200 hp MFWD tractor with rear duals used to pull a disk or field cultivator, standard radial tires will be the best fit on the tractor. While tires are a major contributor to efficiency, operators must first make sure the MFWD tractor is ballasted correctly with the proper weight split. If the tractor is set up incorrectly, the benefits outlined will not be realized by the operator. Consult the operator’s manual to review the manufacturer’s recommendation on how to properly set up the tractor.